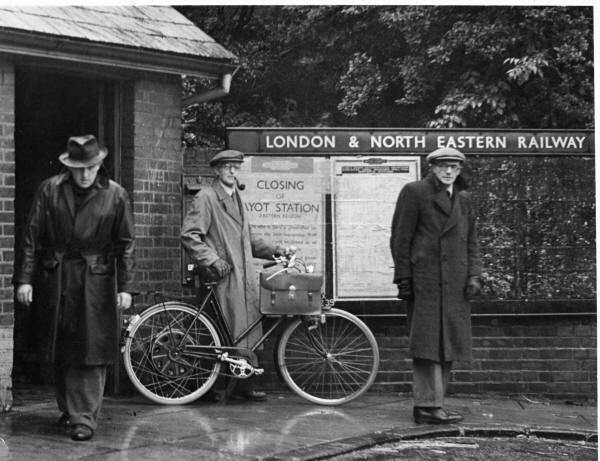 ‘Laurie (dad) is head down leaving the station, Granddad Lovell ( Bill) is holding his bike, and Granddad Seymour, also Bill, is the third person. From the two pictures I think the date on the poster is 26th September 1949. 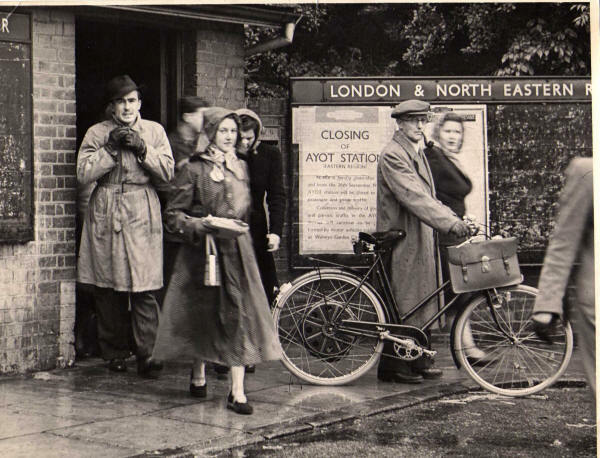 Presumably when Ayot Station was to close. I know the Wheathampstead station was not close until the 60's as we would go to the Welwyn Stores on the train before Daphne could drive. This is a photograph of my father Mr R de Mornay Davies the White haired gentleman, Jeffrey De Haviland and John (cats eyes) Cunnington at the Park Hotel Wheathampstead during the 1940s. I would love to hear of any feedback, i.e. who else is on the picture? Regards, Barbara de Mornay Penny.